Dutch label Armada Music and Insomniac, America’s electronic dance music event promoters, have teamed up to present Armada Nights – a bi-monthly show at Los Angeles’ club, Exchange LA. The collaboration begins this Saturday, July 28th and features artists Sied van Riel and Eco. Hosted by Insomniac and Exchange LA, Armada Nights will feature some of Armada Music’s best dance music talent. Insomniac is well-known as the producer of electronic dance music events including festivals Electric Daisy Carnival, Beyond Wonderland, Escape from Wonderland Halloween and Nocturnal Wonderland in addition to hundreds of regular club and concert events held weekly around the Country. Armada Music is the current four-year title holder of ‘The Best Global Record Label’ and boasts a broad spectrum of world-renowned talent on its roster. Exchange LA is located in the historic core of downtown LA and accommodates up to 1,700 guests and has been voted ‘Best Dance Club in Los Angeles’. Already in 2012, Insomniac and Exchange LA have hosted sold out events featuring Cosmic Gate, Carl Cox, among others. Armada Nights will begin its run this weekend, followed by dates in August, October and December. 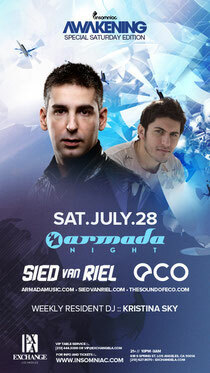 For more information on tickets, show times and future events check out: www.insomniac.com or www.armadamusic.com.